I think last week can best be described as hectic. We had lots of personal stuff going on (don't worry everything is fine) coupled with a full plate at the office. It was one of those weeks when I understand why so many people say "I just don't have time to cook." We've all been there. Thankfully, we made a concerted effort to make at least a few homemade meals in between the chaos. Sometimes you don't even have to technically "cook" to get a homemade meal. Case in point, last Friday we made a giant local salad. That's it, just a big vegetable-filled salad. And maybe it was simply the process of slowing down and prepping the vegetables or maybe it was refueling our bodies with raw goodness, but either way it felt good. Thus, here is our Eat Local Connecticut Challenge meal for last week. 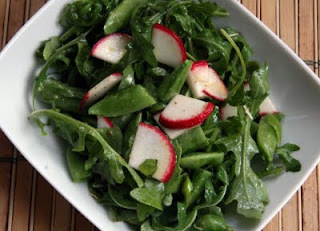 I chopped a small bunch of radishes, course chopped about two cups of sugar snap peas and thinly sliced one scallion and one garlic scape. I tossed everything into a large bowl with as much arugula as I could fit. For the dressing I whisked together 1 tablespoon of really spicy dijon mustard, 2 tablespoons of white balsamic vinegar, a tablespoon of honey, a tablespoon or two of extra virgin olive oil and a pinch of salt. Don't be fooled by the small portion in the photograph. We plated up a small dish strictly for photo purposes. In reality, this salad was huge and was plenty of food for two people. Hey, when it comes to local meals at this time of year, salad is valid. I do have to get to that Elite market! We live close to the mall so Elite is nice location for us to just pop in to.